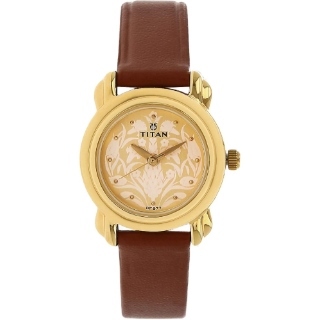 Titan Online Store Sale - Purchase Titan Beige Dial Analog Watch for Women at Rs.1470. This analog watch for women has a round, beige dial with patterns. The dial features plain three hands and markings at five minute intervals. A crown on the case lets you adjust the time. The brown, leather strap is fitted with a buckle closure for maximum comfort to the wearer. Equipped with 3 ATM water-resistant depth, the timepiece is user-friendly. It comes with a 24-month warranty. Also get free shipping in India. All products on Titan store are original and go through strict quality check. Shop now!